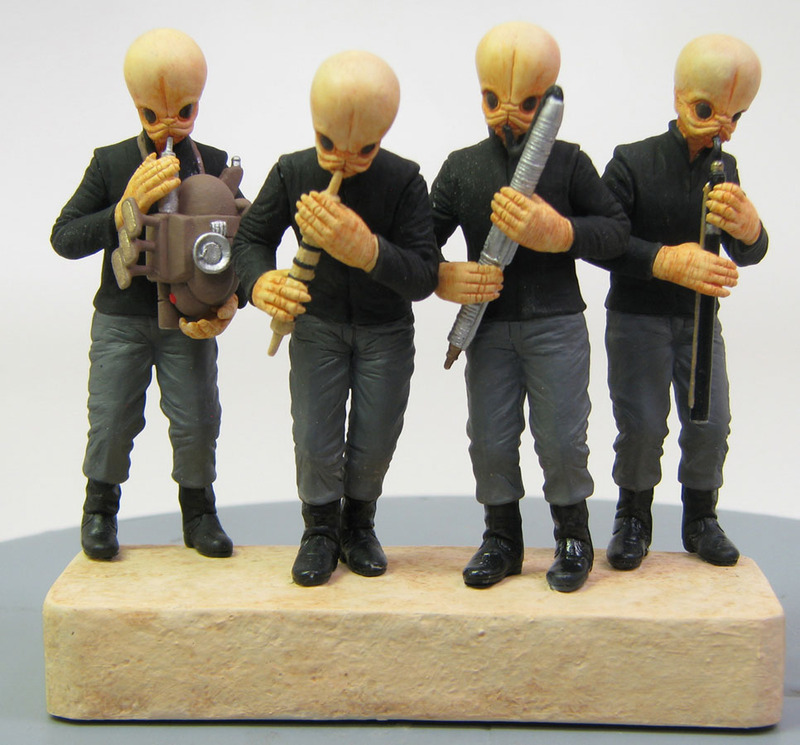 Wear Star Wars Every Day: Week 35 and August prize drawing winners! Since August is not known for its holidays, I turned the last week of August into the #WearStarWarsEveryDay events and holidays week, celebrating some fun fan events and some random holidays, none of which are in August! Plus we have some nice donations to report! Big thanks to Jennifer, Ian, Tim, and an anonymous donor for helping us raise over $80 in the past week, pushing us up to almost $2,600 raised for Collateral Repair Project. Thanks to Trina for her donation of a St. Patrick’s Day Star Wars shirt! Also, thanks to everyone who has lent me apparel seen this week: Anastasia, Mark, Christian, Dartanian, James, and Paul! Remember, every day I wear a new and different Star Wars apparel item, my daily pledgemakers will chip in $4.65! This week, we’ve got a piece of a Rebels costume, a Christmas sweater, two shirts related to theme park Star Wars events and more! This review for Week 35 covers August 26 to September 1 of my wearathon, and an update on fundraising for Collateral Repair Project, a non-profit organization that provides emergency assistance, education, and community support to urban refugees. The uncorrected advance copy of Star Wars: Ahsoka goes to Jennifer Q. And as a special bonus, this copy is signed by the author, E. K. Johnston, whom I met at Salt Lake Comic Con. 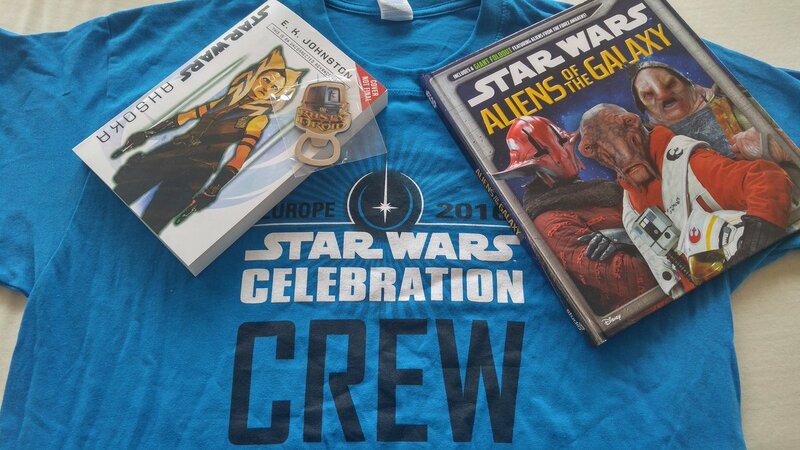 The Star Wars Celebration Europe 2016 Crew shirt goes to Maliha S.
The copy of Star Wars: Aliens of the Galaxy by Jason Fry goes to Tim L.
The Rusty Droid bottle opener from Star Wars Celebration Europe 2016 goes to no one :(. To be eligible, all one had to do is both have liked the Wear Star Wars Every Day facebook page by the end of August and shared one of the August daily photos on their own FB page, and according to my notification tracking, no one did both. So I guess I’ll save the prize for a future prize drawing. Thanks to everyone who has supported Wear Star Wars Every Day so far, both our one-time donors and our per-day pledge makers. If you’d like to chip in at a dime a day or a quarter per day (or more), make your pledge at the per-day pledge form and you can choose whether to support the project for the entire year, or just start at the beginning of September. Or you can just make a one-time or a recurring monthly donation at GoFundMe.com/WearStarWars2016. Get more info on what Wear Star Wars Every Day is all about, or make a donation or a per-day pledge. While each day I continue my project, another $4.65 is donated by our pledge makers, but I’d love to get that total up to $5.00 even (or higher!) for the last quarter of 2016. The 2015 Hallmark Dream Book is out, and it contains some – but not all – of the Star Wars ornaments we saw at SDCC. Curiously, there are two The Force Awakens ornaments that are yet to be revealed. Odds are probably good that one is a BB-8, but the other? UPDATE: Jedi News found out that the Admiral Ackbar we saw at SDCC will be a limited release for Hallmark’s Ornament Premiere on July 11. It will only be available in stores. Head beneath the cut for a shot of the Dream Book’s Star Wars page. Okay, all (well, most of) the new Hallmark Keepsake Christmas ornaments, not just the Star Wars ones are available for purchase today, but whatever. Quibbles. Brave the rush to pick up the ‘The Rise of Lord Vader’ (FrankenVader from the end of Revenge of the Sith,) a scout trooper, the cantina band and/or a LEGO Boba Fett. We first saw the 2014 ornaments nearly a year ago, at SDCC, which means our first look at the next crop is right around the corner. Yuletide, the annual rare-fandoms fanfic gift exchange, had a rule change this year that suddenly made it relevant to our interests – they allowed requests from lesser-ficed parts of large fandoms like Star Wars. So, for the first time, we’re seeing Star Wars fanfics among the offerings. 32 of them, in fact, including a whooping 13 X-Wing fics. Other requests included the Thrawn trilogy and The Old Republic. EU-based fanfic has never been exactly rare, but it does tend to focus on the big ‘ships (ahem) so if you’ve been looking for something a little different, check out the listings. The authors are all currently anonymous, but will be revealed on January 1st, per Yuletide tradition. And a Merry Sithmas to one and all! Santa Maul is proud to report that the Sithmas onslaught continues at the Club Jade Tumblr. Santa Maul hopes your unleashing of holiday rage goes well on this day! Santa Maul is very busy, but he reminds you that Spike TV will be marathoning Star Wars movies starting Friday, January 3rd. Why not Sithmas? Santa Maul does not know, but his vengeance will be swift. It has come to Santa Maul’s attention that Darth Vader, that pan-fried brute, is now being used in place of Santa Claus at Disney World. Santa Maul supposes this is to be expected, as nothing says plebeian like Disney, but he finds the use of a wishy-washy Sith like Vader to be an afront to the very nature of Sithmas. And there probably wasn’t even any violence to liven things up! Santa Maul has reported the incident to his master, Darth Sinterklaas. He expects vengeance will be swift. Your enemies are engorged from the feasting. Now is the time to strike. Happy Thanksgiving. Santa Maul hopes your enemies were sluggish and your feasting was plentiful this Thanksgiving. Santa Maul himself is, of course, gearing up for his (contractually-obligated) favorite day of the year, Black Friday. “But Santa Maul,” you say. “The shopping has started earlier this year, on Thanksgiving itself!” To that, Santa Maul says poppycock. Thanksgiving is a day for feasting and destroying your enemies: Shopping is for every day after that, until the final facedowns of the season and the blood offerings at Sithmas itself. On this, Santa Maul remains firm. That said, if you wish to begin your shopping now, well, upon your own neck be it. Consumerism waits for no Sith. Star Wars is, as always, at the forefront of the trend, with StarWars.com posting their own roundup of deals yesterday. Dunc already revealed the new offerings from Her Universe. And if you are not quite sure what your ‘fangirl’ should want, they now offer gift cards. ThinkGeek is as ever a staple for geek-themed gifts. This year, Santa Maul is much taken with the Star Wars tie clips, cuff links money clips, lightsaber earrings and business card holder, though of course he can not help but be a little tickled by the R2-D2 car charger and Darth Vader stress toy. Santa Maul would not be so neglectful as to forget the year’s books. Though you may have procured it for yourself, do not forget The Making of Star Wars: Return of the Jedi, Star Wars Art: Concept and the many other oversized offerings that magically appear during the fall. For one wishing for to bring a custom level to their lair, Santa Maul is much taken with these Death Star-inspired wall tiles from Tom Spina Design. The 2013 Hallmark ornaments are just now in stores, but early versions of the 2014 ornaments are already on display at their booth in the Lucasfilm Pavilion at San Diego Comic-Con – and at StarWars.com.